Last time I wrote about digitizing LPs. Here’s my newest techno toy: the Zoom H2 digital recorder. I used this on a recent trip to Virginia for the Wayne Henderson Music Festival and Guitar Competition. My sister Jean, a musician and educator who lives near Wayne in Mouth of Wilson, Virginia had invited me and I decided to test the H2 as a field recorder. I was really impressed. I used it for a story I later did for WHQR. You can find the story, and some of my original files, here. 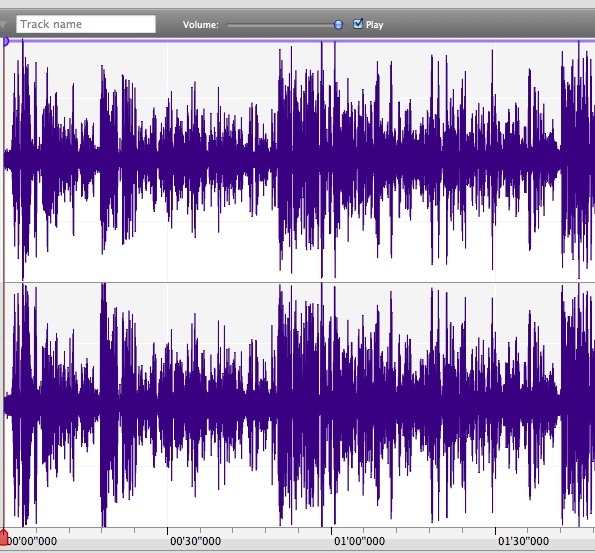 With an 8G card, the H2 can record about 12 hours of stereo in WAV format, which is far less lossy than mp3. 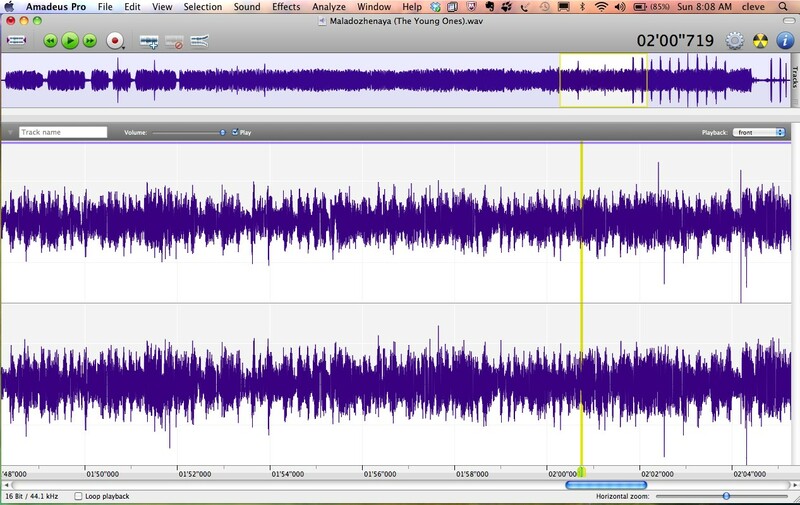 Of course, for the web and for many purposes mp3s are just fine; I use a Mac program called Amadeus to convert WAV to mp3. More on Amadeus later. The H2 actually uses 4 mikes in pairs to record sound. You can direct the sound recording to the front stereo (facing you as you look at the controls), rear stereo (facing away), 2-channel front and rear, and 4-channel surround. I quickly realized that for audio production I got best results from the 4-channel. In this mode the H2 actually makes simultaneous recordings from the front 2-channel and rear 2-channel. You can choose whichever one you like, or both. The front version takes in a 90-degree stereo field, good for a small group of musicians, for example. The rear setting’s field is 120 degrees, better for a larger group. For my music recordings, even though I recorded in 4-channel mode, I only used the rear track since I was recording a fairly large group and didn’t need anything from my direction. What really fascinated me, though, was the way it worked for my interview with Erynn Marshall of the Blue Ridge Music Center. I held the mike about halfway between the 2 of us, so the front channel got my voice and the rear channel got hers. All around us was the ambient noise of people cleaning up after a concert by Doc Watson. 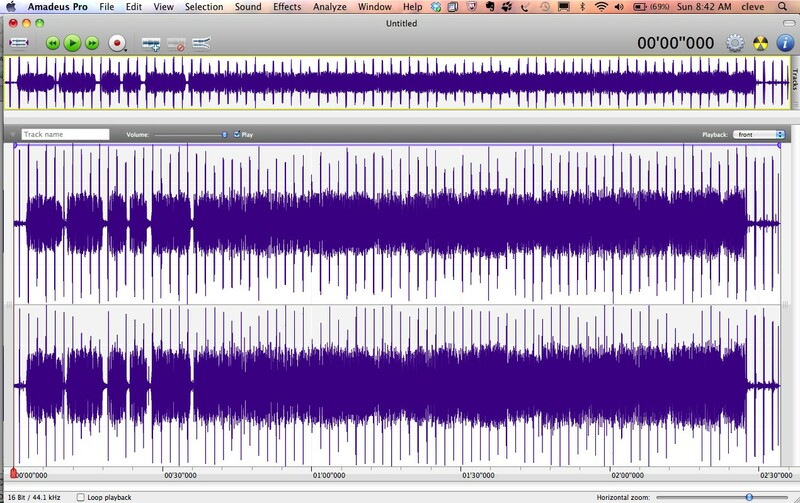 You can see what this looks like in this Amadeus wave file. 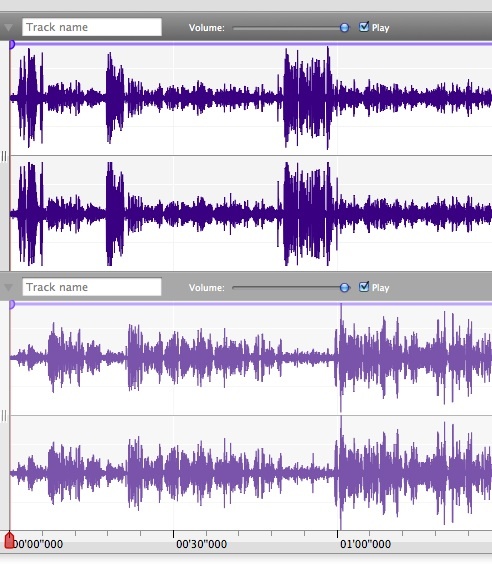 Originally these were two separate files; I copied and pasted one into the other, after clicking “Add New Stereo Track.” So now there are 2 stereo tracks here. My voice is in the 2 upper channels, hers in the lower 2. You can easily see who speaks when. What’s remarkable is that the makers of the H2 thought to flip the stereo image between front and back, so the surrounding ambience is correct even though they point 180 degrees opposite each other. We’re still not at a satisfactory stereo image, though. So I click on the upper track (my voice) and click “Merge With Next Track”. Voila! one single track with nice stereo ambience, and both of our voices in the middle. Some months ago I had bought a USB turntable for $50 at Costco. I had previously digitized cassettes, but never LPs. 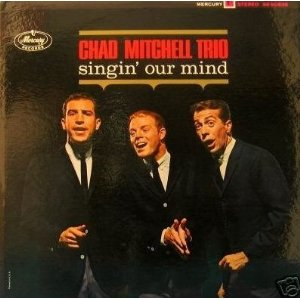 I was glad to find the Chad Mitchell Trio’s “Singin’ Our Mind” album again — most of those tracks are not available as files that I can find, and I have a nostalgic affection for the group. So lacking a cleaner (thanks, Radio Shack), I literally washed the LPs in warm soapy water, patted them dry and finished with a hair dryer. 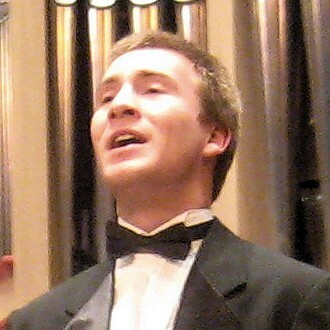 Our son John the opera singer sent us three recordings he made recently at the University of South Carolina. I think they’re the best he’s ever recorded. The Sacred Harp community of Cincinnati has lost one of our dearest friends. Christine Cox died last Wednesday at 87, following a serious stroke in March of this year. Singer Eloise Clark was with her when she died, singing some of her favorite hymns. John Bealle has a wonderful tribute to Chris on his website. Wayne is a celebrated old-time musician and guitar builder who famously kept Eric Clapton waiting 10 years for his to be built. Update 7/12/10: Voice of America recently did a feature story about Wayne. Thanks, Jean!